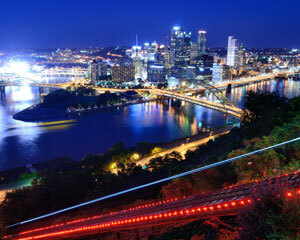 Pittsburgh, affectionately known as the “City of Bridges” and “The Steel City”, has been ranked America’s ‘most livable city’ and is a worldwide top destination. This thriving metropolis is home to several Fortune 500 companies, several banks, and many industrial companies. Such a reputation and affluence makes Pittsburgh a prime market for successful billboard and advertising strategies. The first opportunity stems from the highways that service the city. I-376, the Pennsylvania Turnpike (I-76), and I-79 are just a few examples that would yield high traffic and high exposure to your business through billboards on those highways. Pittsburgh is also home to several universities allowing for out-of-home advertising focused on the college audience. Carnegie Mellon University, Duquesne University and University of Pittsburgh are the most notable, and effective advertising opportunities are abound on their campuses. Zip Codes: 15201, 15202, 15203, 15204, 15205, 15206, 15207, 15208, 15209, 15210, 15211, 15212, 15213, 15214, 15215, 15216, 15217, 15218, 15219, 15220, 15221, 15222, 15223, 15224, 15225, 15226, 15227, 15228, 15229, 15230, 15231, 15232, 15233, 15234, 15235, 15236, 15237, 15238, 15239, 15240, 15241, 15242, 15243, 15244, 15250, 15251, 15252, 15253, 15254, 15255, 15257, 15258, 15259, 15260, 15261, 15262, 15263, 15264, 15265, 15266, 15267, 15268, 15270, 15272, 15274, 15275, 15276, 15277, 15278, 15279, 15281, 15282, 15283, 15285, 15286, 15290.